In the US, plein air events (painting in the open air) attract numerous fantastic artists and produce some of the best art I’ve seen. Although painting in the open air is exactly what I do when I’m field sketching, I don’t generally think of myself as a plein air artist because plein air is very much dominated by landscape artists. But I’ve decided I need to stop thinking this way. So I’m really pleased to be featured in PleinAir Today – the weekly email you see above (click the link to read the article). Find out more about PleinAir Today, Plein Air Magazine and Outdoor Painter. And, if you would like to hear more about my plein air painting (!) and conservation-themed artwork, join me as I speak at The Explorers Club in New York City on September 29. Reservations are required. Milking Time was the 2nd of 3 sketches, created in just a few minutes while the Maasai women milked the cows in the morning. I asked them not to pose but just to go about their usual milking routine, so my time was limited for each sketch. I confess I had no idea that they could milk a cow so quickly, but lack of time is a great motivator and the sketches really did flow from my pencil. Thanks go to the African People & Wildlife Fund in Tanzania for arranging this sketching opportunity for me. I was visiting APW for the 3rd time, learning more about their work with the communities of the Maasai Steppe. I’ve just sent copies of all my sketches back to Tanzania for the people who featured in them. To find out more about my visits to APW and to hear about my conservation-themed artwork, join me as I speak at The Explorers Club in New York City on September 29. Reservations are required. Sometimes I’m contacted by someone who loves a particular painting but the original is already sold. Or maybe the person wants the piece but doesn’t want to pay the price of the original. In either situation, having reproductions available for sale is a great help. I can only create a limited number of original paintings during the course of a year, so it essential for my business too. My original paintings are professionally scanned or photographed and the resulting high resolution digital file is used to create the reproductions. Both Prints and Giclées are Reproductions. The term ‘Print’, although commonly used, has become associated with low quality reproductions or posters, so I try to avoid using this. A Giclée (pronounced jik-lay) is a French word meaning ‘to spray’. It refers to the fact that most reproductions are created on ink jet printers which spray the paint onto the paper, canvas or other surface. An Edition of Giclées is a set of the same size and printed on the same surface. A Limited Edition is a set where the artist decides to only print a certain number and each will be signed and numbered by the artist. If the edition is only 10 pieces, the pieces will be numbered 1/10, 2/10, 3/10 etc. After all 10 are printed and sold, the artist will not produce any more in this size on this surface. For this reason, Limited Editions are more valuable than Open Editions, which are not numbered and where the artist can produce the same piece any number of times. The issue of reproductions can be confusing but it is always worth asking questions if you intend to buy them. Limited Editions can be a wonderful way to build a collection of art at an affordable price. See Limited Edition Giclées of my Paintings. What was your early inspiration to become an artist? When I was growing up I had no intention of being an artist. I enjoyed art but did not study it at school beyond the age of 13. Being an ‘army brat’ and having traveled widely at a young age, I was interested in international relations and history and these are the subjects I studied for my degree in the United Kingdom. It was when I moved to Zimbabwe in 1994 with my husband, that my interest in art was rekindled by the people, places & wildlife I saw around me. We moved to neighboring Botswana in 1996 and by the time we left Africa in 2002, I was well on the road to painting full-time. Further on in the interview I explain why I use vibrant colors, how I would describe Botswana in one word and what has been my most interesting experience in Africa (a clue: it involves an elephant calf and a rope!). Learn more about Pencils For Africa. Once a month I will be showcasing the talents of colleagues in the art world, and I am very happy to introduce you to Tony Fredriksson. 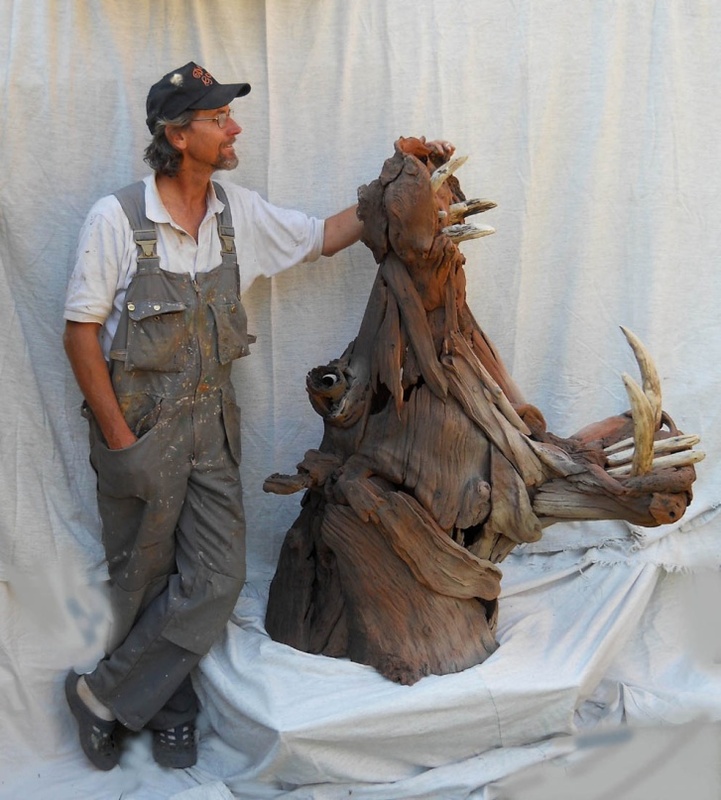 We have not met in person, but Tony is from South Africa and I found his amazing wood sculptures online. I’ve always had a soft spot for sculpture and Tony’s work immediately caught my eye. I hope you enjoy it! the 15km shoreline around the island to produce the 14meter Humpback Whale. You can give an artist a piece of clay and within minutes they can produce something that you can recognize. As a 5 year old I made my own play world from plasticine and that was the best toy my parents ever gave me. I believe we are all given some gift in life and I was fortunate that mine was discovered at a young age and art became my chosen path. After starting out in commercial art and all the disciplines of the printing trade, I ended up doing resin castings of animal sculptures and wore myself out. After producing close to 7000 limited edition sculptures, all hand painted, I ventured into driftwood sculpture for my first ever solo exhibition in 2010. The Adventure – My theme was fish, as our family is fishing mad. 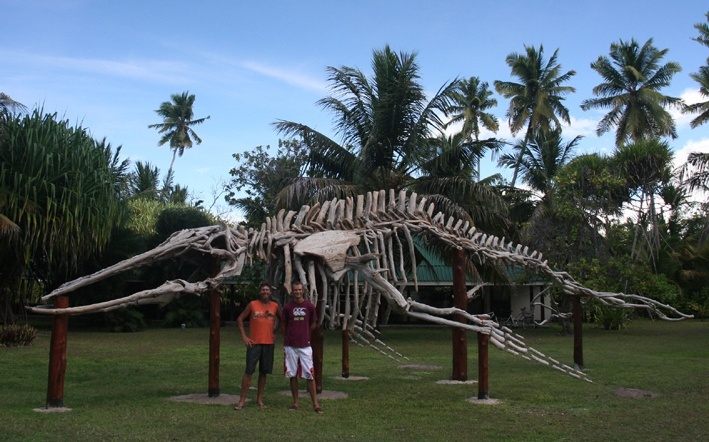 The exhibition was close to being a total sell out and a hotel group commissioned me to make a life-size Whale skeleton on DesRoches Island in the Seychelles. The hotel group also purchased some of the fish sculptures to decorate the private villas on the island and took a liking to my working sketches and commissioned a number to decorate the rooms. Just collecting the wood is an adventure in itself. My bakkie (pickup truck) always carries a shovel, saw and axe just incase I see some wood on the side of the road – which happens all the time. 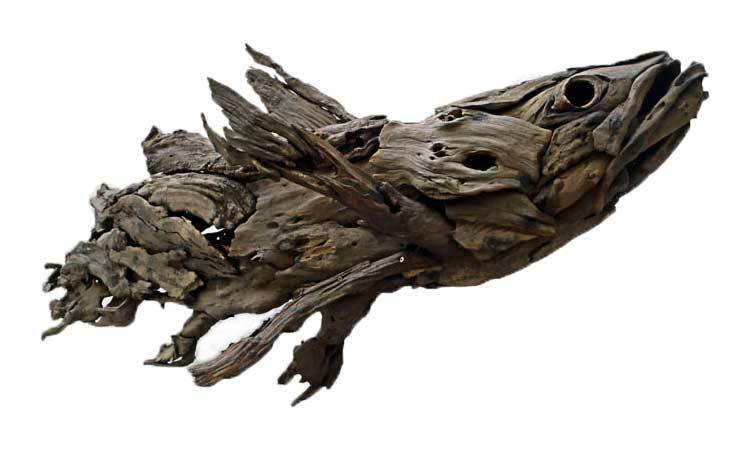 Treasure Hunt – What I have found to be a rewarding part of this kind of sculpture is the exploration and discovery of the weathered pieces of wood. I get so excited when I unearth a special piece from the middle of a dead tree or digging out termite eaten pieces on a game farm, or recovering an old stump from the bottom of a dam on a fishing trip. Inspiration – comes from the pieces themselves, some have passed through my hands dozens of times while I search for that one missing piece. Some sculptures I have abandoned ‘till I can find something on one of my journeys that will complete it. Some have changed shape completely from a cat to an otter a year later. I am learning every year about different woods and the creatures that shape them or the way the wood weathers in different places. The texture of the wood is important when deciding what one wants to portray. I have managed to find white wood that resembles ivory. A History – Many of my friends now have second thoughts when they are about to toss a piece of hardwood onto the fire for a braai (BBQ), and wonder if they should rather give it to me. I have indeed had many pieces brought to me. One was washed up on the beach in Mozambique after it had traveled down a major river, and it ended up as the tip of the trunk on a swimming elephant. I am able to tell the public where each piece has come from as they all have their own history. A swimming elephant designed as a fountain feature or water feature for a rim-flow pool. Endless Variety – On the farm where we live the tractor had eroded away some old roots. One piece inspired me to make a roast chicken. I then took it further and added numerous dishes of food, deserts and a tea set. Once you set your mind in a certain direction the possibilities of what you can sculpt are endless. I have enjoyed making abstract objects, anatomical studies, people, insects, birds and mammals. Many are so popular that I get repeat orders but each one remains an absolute one-off as the found pieces determine the outcome. The size, expression and posture have to be worked out from a dominant part of the subject. Three vultures all one-offs, just by coincidence they were brought by attorneys and lawyers. The Source – I have been privileged to teach my own children art in junior school. All five grades would run to my class for every lesson, eager to discover something new that they could do. From baking a cake, building a wall or just playing with the food on your plate, we are all creative in some way. According to the Bible we are made in God’s image so we shouldn’t be surprised at how fulfilling the creative process is. I certainly feel I get some help from the Lord as some of the pieces seem to fit together miraculously, as if they belonged together. This Ballerina was inspired by her torso, she to spent years underground till the road wore through and the old roots of a Silver Oak appeared. Penguins really need little description. On land they are amusing. In water they are astonishing. Here are some African (Jackass) Penguins I sketched at Boulders Beach in South Africa. There are no underwater sketches to show how astonishing they are! Join me on March 15th 2014 at the Mamaroneck Artists’ Guild in Larchmont, New York as I teach a Children’s Sketch Workshop. I will use my photos and video from Africa as I demonstrate and teach how to sketch wildlife using simple shapes. The workshop is open to children Grade 5 and older. Please call or email the gallery to reserve a place. Do Your Children Want to Learn How to Sketch African Wildlife? At last a storm has passed us by! As a result, my reception and talk this evening will go ahead as planned. Please join me on March 3rd at 7pm at the Bronxville Women’s Club to hear about my visits to the African People & Wildlife Fund (APW) in Tanzania. I have visited APW twice (with another visit planned this year), in order to sketch on site and learn about their work with the mostly Maasai community of Loibor Siret on the Maasai Steppe. During the talk, I will show my field sketches, studio paintings and video as I discuss my work as an artist in Africa and explain how my visits to African conservation projects have inspired the creation of a body of conservation-themed art. This talk is in conjunction with my exhibition, Lions, Livestock & Living Walls, which will be on display for the month of March at the Bronxville Women’s Club. APW and BWC will both receive 20% of sale proceeds from the exhibition. The Bronxville Women’s Club is located at 135 Midland Avenue, Bronxville, NY 10708. All are welcome. Lions, Livestock & Living Walls Exhibit in Bronxville, New York. Elephants provoke strong opinions. 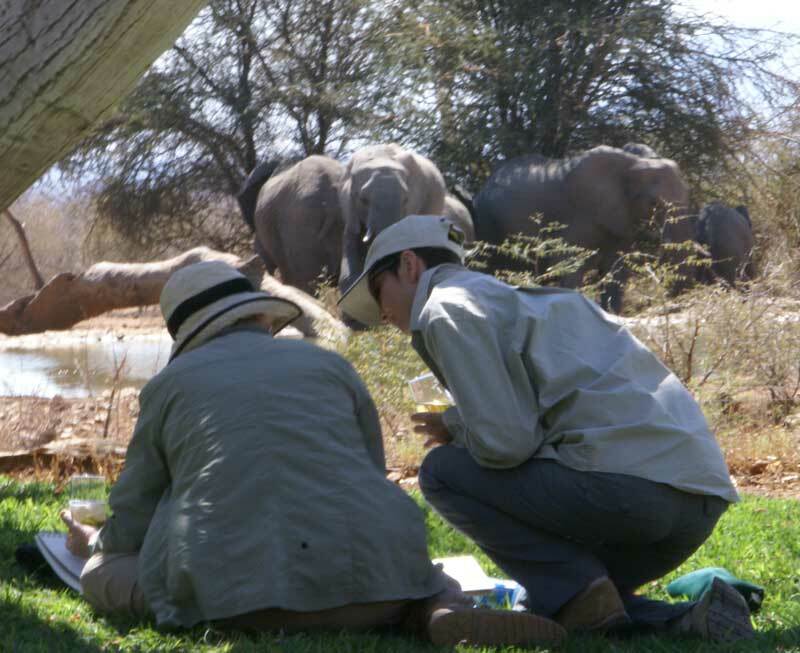 Tourists want to see them on safari and usually encounter calm, relaxed elephants in protected national parks, viewing them from the relative safety of a vehicle. However, rural-dwelling Africans are more likely to encounter elephants on foot, outside protected areas, in places and situations where elephants are more wary of, or aggressive towards, people. Children who have to pass elephant herds on their walk to school, or families whose crops are trampled and eaten by hungry elephants may feel fear and distrust rather than admiration and wonder when they see elephants. Elephant! resulted from a conversation I had with Maasai men in Tanzania, while I visited the African People & Wildlife Fund (APW) for my 2nd Conservation Sketching Expedition. The men looked through my sketchbook, seeing sketches of people, cattle and homesteads, but their first question to me was ‘are you afraid of elephants?’. The question made me think more about their encounters with elephants and resulted in this painting, which illustrates two contrasting views. The large head on the left of center is an elephant cow, painted in a relaxed pose, with her long, gently curved trunk leading to smaller images of the herd and a safari vehicle containing tourists. 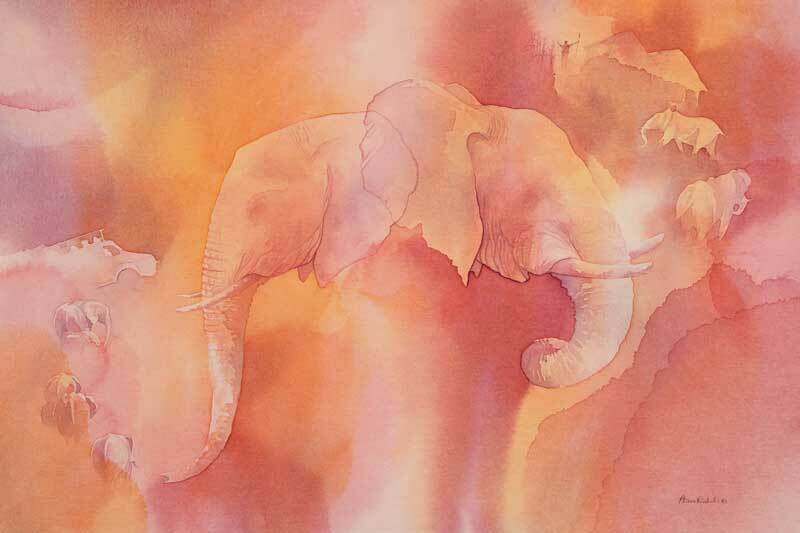 The washes of color used on this side of the painting have soft edges and there is a circular flow, down the elephant’s trunk, around the herd and towards the vehicle. In contrast the large elephant head on the right is an agitated bull. His ears are raised and his trunk curled, while his upturned tusks point towards 2 more bulls in similar poses, and a man attempting to keep the elephants away from his maize crop and home. On this side of the painting there are stronger reds and hard-edged washes, while the smaller elephants are angular and facing opposite directions. The original acrylic painting of Elephant! is available for sale, priced at US$3200. If it is sold privately I will donate 30% of the sale price to APW. If it sells during an exhibition where the venue collects a commission (usually between 10-40%), APW will still receive a minimum of 10%. Limited edition giclées are also available with a 20% donation to APW from the sale of each piece. See my Field Sketches from Tanzania. Remember to join me on January 23 as I talk about my Conservation-Themed Art and Africa! As part of the Green Speaker Series, I will be interviewed by international documentary photographer Daryl Hawk and will then talk about my conservation-inspired Art. You will see field sketches, studio paintings and video as I discuss my work as an artist in Africa and will explain how I turn a complex conservation issue into a finished painting. I will also discuss the work of the Painted Dog Conservation project in Zimbabwe and the African People & Wildlife Fund in Tanzania. All are welcome. Wilton Library, 137 Old Ridgefield Road Wilton, CT 06897. This Green Speaker talk is co-sponsored by Wilton Go Green and Wilton Library. Come and join me on a cold January evening to talk about Africa! Recently I showed you On The Edge, my painting based on the doctoral thesis of Dr Esther van der Meer. 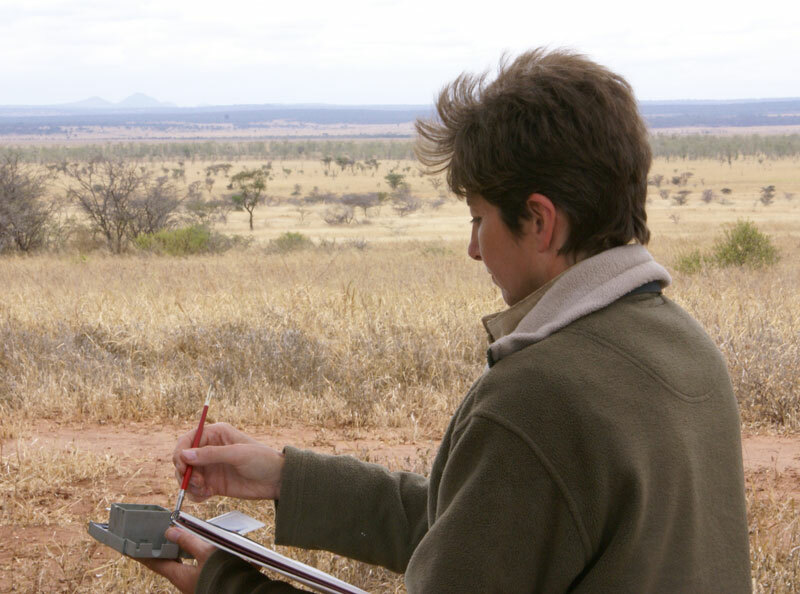 Her thesis examines why Painted Dogs (African wild dogs) are choosing to move out of the relative safety of Hwange National Park in Zimbabwe and live instead in the buffer zone around the park where they have frequent fatal encounters with people. Read further details here. I received a wonderful response to this painting and I’m very pleased to tell you that it now has a new home with a collector in India who has an interest in Africa and conservation. I donate a percentage from every sale towards conservation, so the Painted Dog Conservation project will be receiving US$1225 to help make the buffer zone around Hwange National Park safer for Painted Dogs! 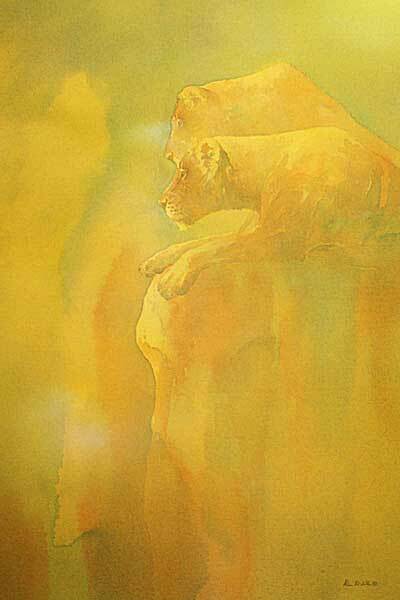 On The Edge is also available as a limited edition reproduction. Please contact me for details. Choose Art Inspired by Africa! A donation is made to African Conservation from every sale! Free Shipping & Donations to Conservation! Here in the US it was Thanksgiving on Thursday. This is one of my favorite holidays because there are no gifts to give and no cards to send. Of course it is followed immediately by Black Friday, the 1st official shopping day of the Holiday Season, apparently named by police departments in dread of the massive traffic jams and sometimes violent incidents caused by the huge volume of shoppers. Ugh! Black is a color I never use in my work (even on Black Friday) because deep blues, browns, greys and greens create more interesting darks in a painting, especially when layered on top of each other. So, from now on, I will be changing Black Friday to Colorful Friday, which is a far more appropriate name given the nature of my work! If you are in the US, I hope you had a wonderful Thanksgiving! And if you are not, wait until Colorful Friday then browse my website for holidays gifts from the comfort of your home or office (colorful attire not compulsory), knowing that every purchase allows me to donate a percentage towards African conservation! This entry was posted in Blog Posts, For Artists and tagged Africa, art, conservation, nicholls, painting, wildlife art on November 29, 2013 by Alison.